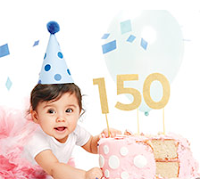 Carter's is hosting a $150 Gift Card Sweepstakes! If you have a child, post a picture or video of your happy moments to enter this Carter's $150 Gift Card Sweepstakes! The lucky winner will score two $150 Carter's gift cards! Enter via Twitter, Instagram, or their website! Be sure to use their specific hashtags if you enter through Twitter or Instagram! Good luck!